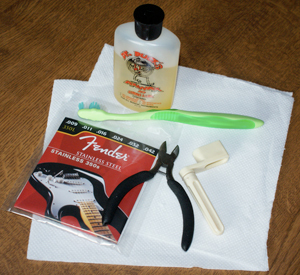 When changing electric guitar strings you can either replace strings one at a time, or remove all strings if the fretboard requires cleaning, see Change Guitar Strings for further info. From the neck up the strings are attached to an electric guitar in the same way as for an acoustic guitar. The main difference is in how the strings are attached at the body end. 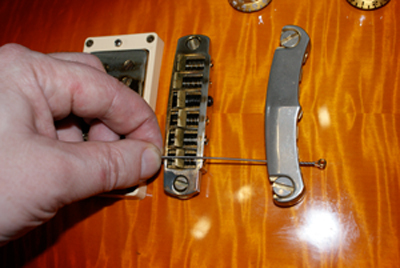 Electric guitars have various different bridge types which require slightly different techniques to hold the strings, but none of them are difficult to deal with. The main fittings are tailpiece attachment and through the body attachment. 2. Thread the new string through the tailpiece or body of the guitar. Be careful not to put kinks into the new string. 3. Pull the string over the Bridge Saddle and Top Nut. 4. Bring the string up the centre of the headstock, and thread the end of the string through the hole in the capstan leaving just a little slack. You want the string on the inside of the tuning peg. 5. Bend the string back towards the centre of the headstock, this helps retain the string. 6. 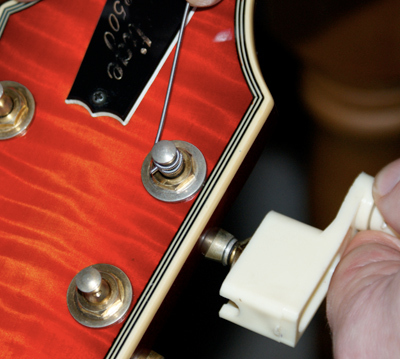 Wind the tuning peg until the slack is removed either using String Winder or fingers. 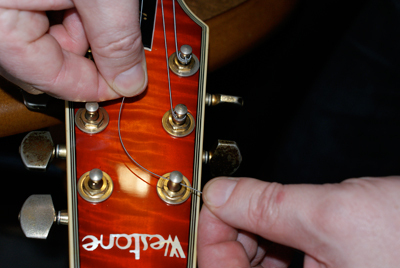 Ensure the the final winding is closest to the surface of the headstock. 7. 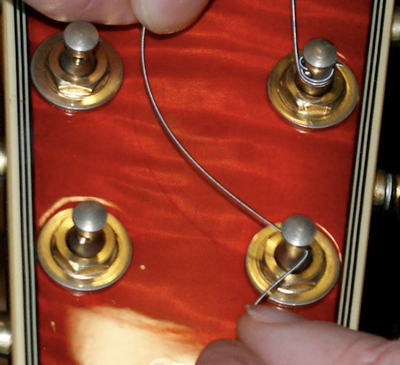 Tune the string to the correct pitch and repeat with the remaining strings until complete. 8. 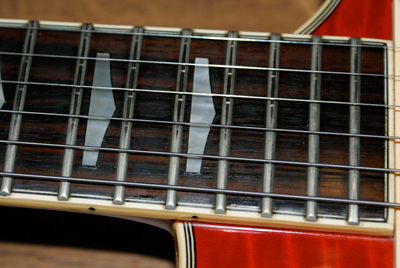 Give each string a few tugs to stretch it out and then retune it to the correct pitch. 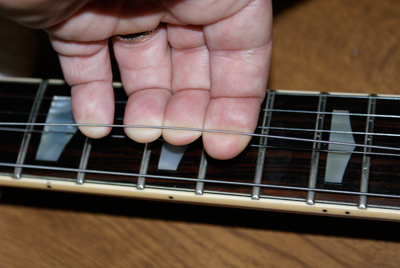 It is best if you repeat this a few times until stretching the string no longer puts the string out of touch, this will help keep the guitar in tune longer. 9. If you have cutters, simply snip the excess string. If you don't have cutters just wind the excess string in a loop to prevent injury. 10. Dispose of old strings and excess new strings sensibly.